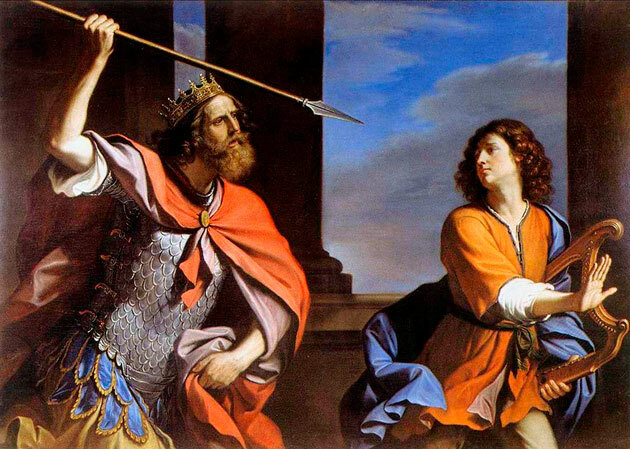 The famous painting, realized by Guercino in 1646 for the Cardinal Falconieri, depicts the biblical story narrated in the first Book of Samuel (18, 10), in which the king Saul, jealous of the military successes of David – who triumphed over Goliath – and inspired by an evil spirit, tries to pierce the young man, while he was entertaining the king with the music of his harp. Guercino conceived the confrontation through a close-up, in order to enhance the contrast between the two opposite figures. Saul, imposing with his crown and armour, wielding the spear, and the defenceless and slight David, armed only with his harp, with which he had soothed the sufferings of the king. The theme of the picture was chosen in keeping with the subject matter of the painting which was the former pendant of the Barberini canvas and depicted Samson revealing the secret of his superhuman strength to Delilah. Thus, the pair dealt with the tricks, threats or flatteries, with which the evil spirit puts the innocents to the test, as well as with the fateful effects of jealousy, perhaps with some reference to the troubled political career of the patron. On the other hand, the painter himself may have found something familiar in the motif of envy and rivalry, surely very common among the artists of his time, and sometime evoked just through the example of Saul and David, as in the words of the Cardinal Sforza Pallavicino, who reminded that “in the same way, the authors of famous works – be they either artworks, or acts of military bravery or achievements of political prudence or of genius – are fond of being emulated but not surpassed” (Arte della perfezion Cristiana, 1665).